Today’s post is a guest post from Joe Cox, Marketing Director at SocialVolt, a Social: IRL sponsor offering web-based social media management solutions for companies and agencies that integrate engagement, brand monitoring, campaigns, influencer management, and compliance. 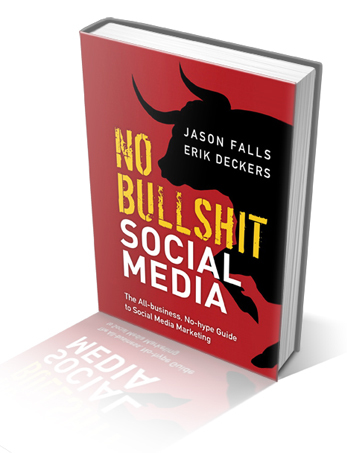 The new book by Jason Falls and Erik Deckers, “No Bullsh*t Social Media,” (affiliate link) is really less of a book and more of a translator between “social media people” and “business people”. It would be a mistake to skip this book just because it’s another book about social media. I’ve read them all too, and at some point you’ve heard it all and it starts to become less about learning and more about preaching to the choir. However, this book is not a 10,000 feet in the air look down at the world of social media, but instead a boiled down, in the trenches approach to explaining what social media can do and won’t do for a company. The key to its value is that it does this in an absolute business first approach and backs up everything it says with case studies and comparisons to traditional marketing and business in a language that executives understand. It’s the Rosetta Stone of social media marketing for business. Use it as a translation device between you and the decision makers in your company for the best success. The book reminds us not to get caught up in the hype. Yes, it’s a different place than it was three years ago, but social media still has a long way to go before it’s used universally as a way to communicate to customers. There’s also a huge gap between those using it and those using it effectively. For example, look at Altimeter Group’s new study that found less than half of companies that are using social media are doing so with a strategic plan behind it. Essentially, people are still flying blind with no clear goals or objectives. The book is written in a colorful way from the title onward and proves that a book doesn’t have to be boring and long winded to have real business worth. Early in the book they tackle ROI in a great way. It’s always the big elephant in the room and the first thing that people who don’t understand social media will bring up. Their explanation is great! Turns out, ROI isn’t even the right question to begin with. You can’t ask what the ROI is before you even get started, it’s a backwards approach! ROI is a business metric and that means you’ll need to set business goals that track to your social media strategy. Yes it can be done, and we currently do exactly this with digital as well as media buying. It also needs to be said that there is more worth to social media than simply financial. They bring up a great quote from Meerman Scott asking, “What’s the ROI of your secretary? !” Meaning that you don’t measure the ROI of the person who answers the phones at the front desk, so how is social media different? I also particularly enjoyed that towards the end of the book, Jason talks about his hometown of Pikeville, Kentucky and how a small town ecosystem mirrors closely what we see happening in social media today. Since I come from the small town of Pleasant Hill, Missouri, the comparison really hit home and I could clearly visually and relate to his point. I greatly enjoyed this book, but not just as a book to teach people what social media is, I enjoyed it because it helps people see how social media has matured into something a business can utilize safely, effectively, and most importantly, strategically. Yet this book does it in a way that still keeps all the “squishy” parts of social media intact. I recommend you go out and grab this book and don’t miss Jason as he swings into Wichita, Kansas, for a Social:IRL event on January 31. Join Social: IRL and Jason Falls in Wichita on January 31. Limited registrations just $35. All attendees will receive a free copy of Jason’s “No BS Social Media” book reviewed above.